Empire Magazine - the last refuge of people who can't be bothered just Googling movies they're interested in - drew up a list of the greatest comicbook characters of all time, and Wonder Woman made number 20. The hell? Fine, Superman, Batman, Spider-Man, I'll even give 'em Judge Dredd - but Magneto's greater than Wonder Woman? Halo Jones? John-F&#%ing-Constantine? We're not talking "well-written," we're talking great, and 95% of people who've heard of him think he's Neo from The Matrix with a cigarette hanging out of his mouth. Hell mend 'em. She is Princess Diana to her Amazon sisters and Wonder Woman to the rest of the world. She is a warrior for truth and a relentless fighter for justice. Mind you, to give Empire their due - and this'll be the only time I do that, so pay attention - to judge by the accompanying text in their article, they wrote their piece before Gail Simone turned up, Jesus-like, and lifted Wondy bodily out of the mess DC has dropped her in. Her own title stalled on the starting grid, then given another bullet to the head with big-name recruit Jodi Picoult handed the poisoned chalice of tying her issues into Amazons Attack - and then there was Justice League of America, the source of today's figure, in which Diana's main contribution to things was to sit around a table with Bruce and Clark arguing, while Brad Meltzer's favourite heroes got the Mary Sue treatment elsewhere. I wasn't even bothering to read Wonder Woman, that's how bad it'd got. This is the... actually, how many Wonder Woman figures have I reviewed now? A few, anyway, which is why the intros get progressively less factual and more about throwing off random diatribes to get the readers all worked up - current affairs TV has nothing on me. Still, DC Direct have a thicker skin than a George W. Bush press spokesman, so while DC itself busily mucked about with JLA, the JLA action figure line, based on the art of Ed Benes, chugged on unworried. You never know, maybe they'll get to Zatanna eventually. Benes Woman looks like she'd like to be serious, but it's not happening with those dimensions, and bright, cheerful colours. Put her on her own and she's alright, but alongside other figures the contrast is startling, with her skin almost radiantly pink, her face weirdly cartoony, and the gold of her girdle and bustier a vibrant yellow. She's kind of got a powerful physique - there's a lot of muscles there, certainly - but based on Benes's art, she looks more like a body sculptor than a fighter, especially with her rockin' thighs terminating in hips that suggest Diana's been borrowing the Atom's shrinking belt. Oddly for a Benes figure, despite the highish hip line, more than 20% of her backside is covered by her briefs - the art being what it is, that probably counts as a sculpt/paint error - but her bust is true to artistic form, going with a push-up bra look instead of anything rational. Just to show off, the figure has a separate bustier chest piece, allowing her ornamental cleavage to be replicated in all its silly glory. Her face is not good. At a glance it looks silly, with her inflated lips in a pout so prominent they're taking the whole lower half of her visage with them, and a somewhat thick nose between bland eyes not helping matters. It's only when you look at the figure closely, and compare it to the art, that you realise it's actually a pretty near shot - it just stumbles at the last hurdle, resulting in a bit of an embarrassment. It's the inking that's missing, really - the shapes are roughly right, but without the definition-adding work of an inker, Diana looks over-rounded and caricaturish, kind of like a sophisticated balloon animal. It's certainly the weakest of the three JLA line faces I've got - Di, Hawkgirl, and Vixen (still haven't found Dinah). Her articulation is what you'd expect. The balljoint neck is limited rather severely by the hair falling to her right shoulder, which means that while you can turn her head a fair way, you're stuck with whatever degree of tilt the hair chooses to impose, which is a bugger for fine-tuning a pose. She's got swivel/pin shoulders, pin elbows, and swivel wrists, with the elbow joints being inward-facing at about 35-40°, and the shoulders not quite having the range to let her arms rest at her side, relaxed-like. There's no waist, and just peg hips and pin knees. 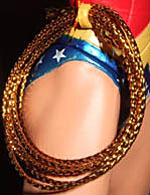 She's got the obligatory coil of gold cord representing her lasso, fixed in a clasp that doesn't immediately seem to be able to open - I'm not pushing it, since even if it is supposed to be removable, once you unroll one of those lassos they rarely go back in place without a fight. 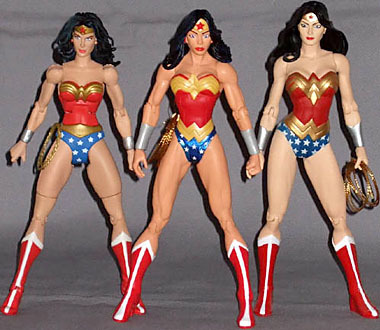 Aside from that, her only accessory is the usual Justice League of America base, with a single peg for the right foot. I don't see any obvious warping in my figure from being packed improperly, but with her right foot down flat the left hovers half a centimeter in the air; she needs her right knee bent, and her left leg back to put the foot at an angle, to be properly in contact with the ground. She's got her positives, has JLA Diana - mainly her cleavage and those thighs - but I can't say I like her as a figure. She hasn't got the playability to match up to DCU Wonder Woman - if you can find her - and in a contest of pure display value, DC Direct's own Wondy from the earlier Wonder Woman series bends this one over her knee and spanks her but good.